The Brewery isn’t like it used to be. 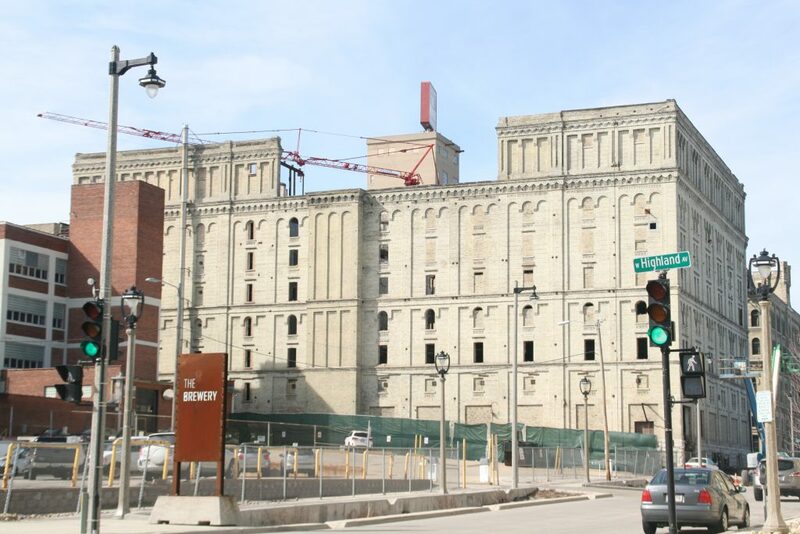 The neighborhood emerging out of the former Pabst Brewery complex on the northwest edge of downtown Milwaukee is quickly becoming an active place. A number of new buildings have been added to the area, historic buildings have been converted to new uses and now two more historic structures are finding new life. Florida-based Whitestone Realty Capital is converting the former malt house and elevator to an apartment complex. Just to the west of that, the former First German Methodist Church, long owned by the Pabst, is about to be born-again as a brewery. 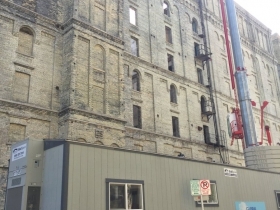 The development of the latter is happening under the guidance of KM Development Corp, an arm of Zilber Ltd. that is leading the brewery’s redevelopment. The area is seeing a substantial amount of change. In addition to the two construction projects, work on Preservation Park is underway, the massive Milwaukee Bucks arena project is underway just to the east and Eleven25, a 400-bed student housing development, opened this school year, bringing with it a publicly-accessible food court. Whitestone is converting the former malt house and malt elevator buildings into 118 market-rate apartments. The project, which was originally approved in 2014, has been anticipated for years, with the development team originally proposing it as senior housing. Global Builders Inc. is serving as the project’s general contractor. Goldenholz & Associates of Florida is serving as the project architect. 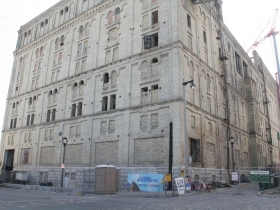 The buildings date back as far back as 1882 and contain a combined 158,500 square-feet of space. They’re instantly recognizable to many as Building 24 (the malt house) serves as the southern anchor of the gigantic Pabst sign that straddles W. Juneau Ave. Building 25, the malt elevator, is a narrow building that stands between the former church and the significantly larger malt house. The project is receiving federal and state historic preservation tax credits. A building permit lists the estimated cost at $15,526,420. For more on this project, see my 2014 article on the project’s approval. Pabst is brewing beer in Milwaukee again. The brewing giant, which at its peak in 1978 brewed 15.6 million barrels of beer in a 28-building campus on the northwest side of downtown Milwaukee, will open their new brewery to the public on Friday, April 14th. 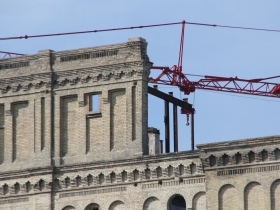 The new operation, which encompasses just one building and a planned 4,000 barrels per year, is a substantial step for the company, which once left a sour taste in many Milwaukeean’s mouths. 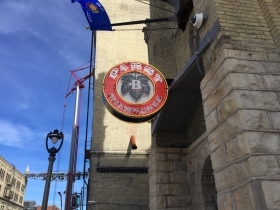 In 1996, under a different ownership group, the Pabst Brewing Company closed their entire Milwaukee brewery with no notice. The abrupt closure left hundreds of Milwaukeeans unemployed and even more without a desire to drink more of the beer. It also created a black hole on the edge of Downtown. Today the former brewing complex, now a neighborhood known as The Brewery, is a diverse and thriving area and Pabst is coming back. The one-time brewing giant, which now has most of its beers contract brewed by MillerCoors, is opening a small brewery, restaurant and bar in a church that the company once owned. According to company Chairman and CEO Eugene Kashper it’s the first step in becoming a good corporate citizen in Milwaukee. The 7,000 square-foot, two-level building, known in company records as building 23, was built 144 years ago as the First German Methodist Church. Pabst acquired the church in 1898 and used the church for everything from the Forst Keller restaurant to an employee training facility. 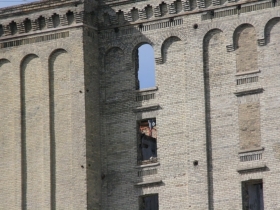 Since 1996 it has sat empty, the last historic building to be rehabbed at the 20-acre complex. 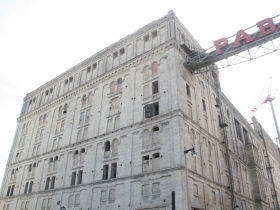 For more on this project, see my recent article Inside the New Pabst Brewery. A substantial number of projects have been completed at The Brewery. The Pabst Professional Center office building is complete and has attracted a number of tenants, including recently profiled SafeNet Consulting and a satellite office for Pabst Brewing. Streetscaping work has been completed that gives W. Juneau Ave. a layout very similar to Broadway in the Historic Third Ward. The Frederick Lofts (new construction), Brewery Point Apartments (new construction), Eleven25 (adaptive reuse) and Blue Ribbon Lofts (adaptive reuse) apartment buildings have been completed. 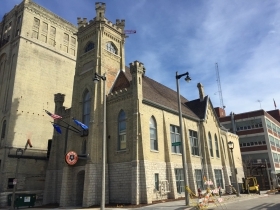 The UW-Milwaukee Zilber School of Public Health (adaptive reuse and new construction) has a significant presence in the neighborhood. Cardinal Stritch University is vacating Building 14, the former Pabst research lab, at the end of May, with developer Josh Jeffers acquiring the building and an adjacent historic building with an intent to convert them to housing. 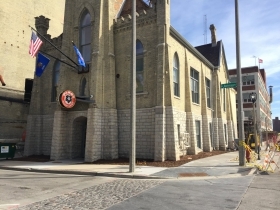 Best Place at the Historic Pabst Brewery, a bar and hall, has opened a second hall known as the Great Hall. The Brewhouse Inn and Suites hotel and attached Jackson’s Blue Ribbon Pub do a brisk business. The LEED Gold certified parking garage opened in 2009 with 908 stalls. The former boiler house (Building 10) is now the Boiler House Office Building and has been open since 2008. Zilber Park is open, honoring the legacy of Joseph and Vera Zilber. Preservation Park is under construction just east of the Whitestone project. 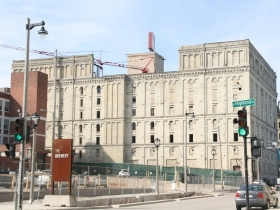 Milwaukee Brewing Company is working to open a brewery in the former Shipping Center (Building 42), originally built in 1970. This is great to see. Now add an outdoor Christmas market from Thanksgiving until Christmas complete with those German chalets selling food etc. Glad to see it’s becoming a neighborhood now! Let’s keep it going and look to make it a sustainable area for growth. Add a grocery store as part of that and let’s look at capping 43. Spot on, Jerry. Milwaukee is so ready for a Christkindlemarket during the holidays. Then imagine Stille Nacht (Silent Night) performed on the amazing organ at the stunning St. John’s Evangelical Lutheran Church (Evangelische Luth. St. Johanneskirche) just over the McKinley Blvd pedestrian bridge from the Pabst Brewery at 8th and Vliet. Built in Gothic Revival style in 1889, it is considered to be one of the finest examples of German Lutheran church architecture in the United States. German Americans during WWI were seen as anti American and unpatriotic unless they renounced the cultural traditions of their homeland – there are lessons for today and Milwaukee should be proud of all of our rich ethnic heritage. The area is perfect for an outdoor market. The indoor Christkindlmarket used to have more vendors and had more of a family atmosphere. Not it just has a veneer of a market and has turned into an excuse to drink. In 2016 there was a loud band in the main hall, making it impossible to talk. It was a rock band to boot – at least a polka band or something like that would be more authentic. We decided not to go again if this was what it was going to be in the future.